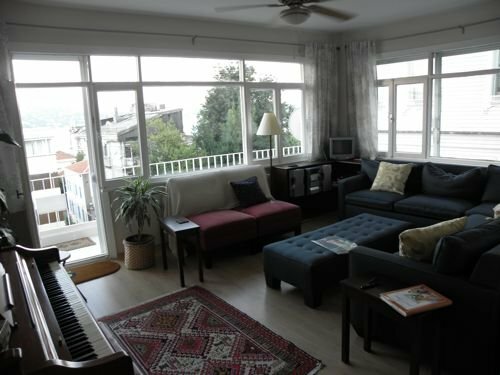 The weather is cooling off for us here in Istanbul, and I’ve just welcomed my first guest into my spacious Arnavutköy home—Sally Nankivell from Grand Marais. She’d visited the last time I was at Robert College and couldn’t resist the temptation of another trip (lucky me). Sally arrived on Sunday morning, and I was committed to a parent’s open house at school. 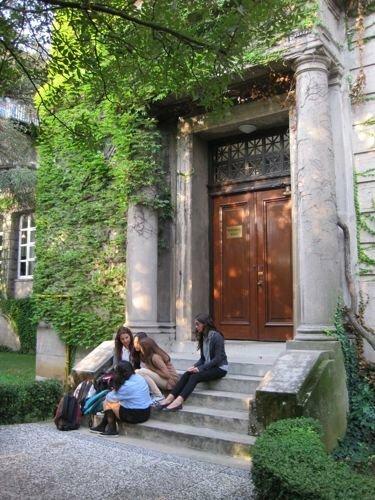 Students chatting outside the building before school. My friend David (who knew Sally from her last visit) offered to meet her at the airport, a godsend. I sent him off with a set of keys, then took Libby on her morning walk, planning to do some editing and writing before I headed up to school for the open house (my writing has taken a back seat lately). Just as I reached our building, I was hit with a devastating realization: My keys were still in the apartment. ARAUGHHH!!! This had been my greatest fear since moving in, as I had no landlord. 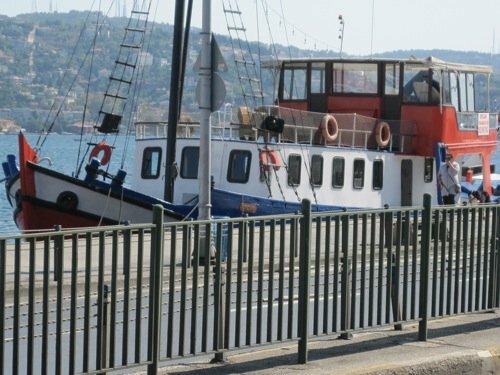 Libby and I had enjoyed our FLAT walk along the Bosphorous. All was not lost, though, since I’d anticipated this very dilemma. I’d had an extra set of keys made to leave with the guards up at the school. I’d explained to them in my shaky Turkish that I might need them if I got locked out. Thankful that for once I’d thought ahead, I forged on. It meant a serious uphill climb and a wasted hour, but at least I’d have time to change for the open house. Heck, I told myself, it was good exercise and a gorgeous morning. I decided to climb up to my office to get a little work done (another 99 stairs), but I couldn’t find my reading glasses. This was NOT my day. I finally got through to Elvan (the housing supervisor), who found someone to retreive the key from her office. My compatriot Reagan took pity on me and kindly drove me home to change. Though there was no time for a shower, at least I was able to don nicer clothes and sort out my hair. Open house went fine, thanks to my charming translator Irmak—less than half of the parents spoke English. When I returned home, David and Sally were already lounging in the living room. It felt great to collapse and chat with them for a while and leave the morning’s trials behind. My living room, where David and Sally awaited me. My upstairs neighbor, Füsün, had invited us all up for coffee, so we shook ourselves awake to head up. We’d had no idea what a treat we were in for. 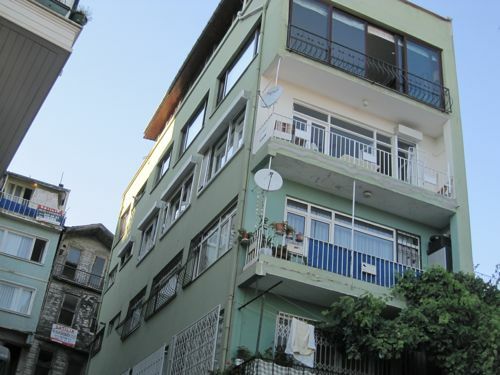 Füsün’s apartment is two stories—both with breathtaking views of the Bosphorous. We chatted on her rooftop terrace over Turkish coffee, prepared by her charming mother Şukran (from Izmir). I was tickled to meet my new neighbors and look forward to good times with them. 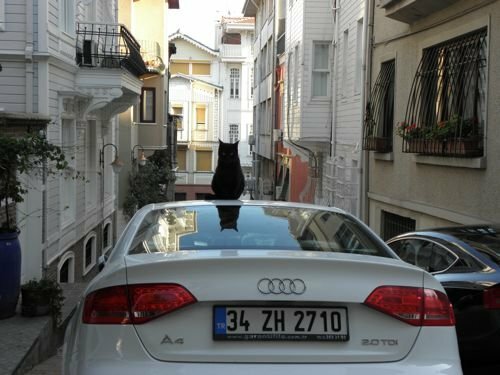 A neighborhood cat supervising the neighborhood from the safety of a car roof..
What a day!!! Thank you for the look into your world. I look forward to your blogs. Dear Ann Marie, Seriously what a day you had, may be if you tie a spare key to Libby’s leash you never have to worry when you go for a walk with her. Just an idea. I love reading your blog, Have a great day in Istanbul.